This piece is a serving table. The top hinges open. The drawer front hinges down for access when things are on top. It is an interesting piece. 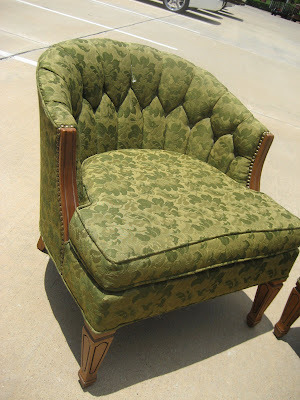 See what I got, when I stopped at a local thrift store? Super clean. Not just one, but two. Aren't they divine? Absolutely DIVINE!!! The chairs and the table -WOW! Is that a hanging lamp sitting next to the table. Lucky Girl!! Trying to find someone to make the drive to Athens soon! It's about a two hour drive from Richland Hills. Hi Maureen, yes, those are swag lamps. They rock, don't they? Bring a truck when you come, k? Looks like you scored big and are having alot of good luck yourself! Love everything you found! Just want you to know I really enjoyed the pictures of the sale from your previous couple posts---whoever took them did an excellent job...showed people laughing, talking and enjoying themselves as well as the great stuff. Fun, fun! 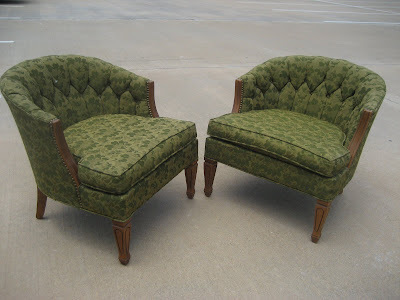 Cool chairs. I'll be there tomorrow to spruce up my space too. Sorry I missed you today. I was supposed to give you a hug from David...your loss!!! 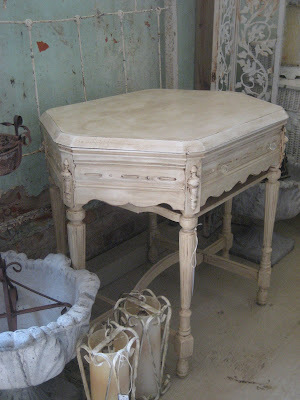 That would make a darling writing desk. Congrats on the awesome finds! You're on a roll! 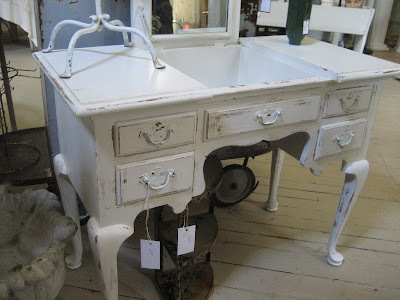 I really loved the vanity/desk....very charming. I agree with Junk Girl. The pictures from the opening at at Winnie and Tulas on your previous posts are great!